SoundCloud was established in Berlin in August 2007 by Swedish sound designer Alexander Ljung and Swedish electronic musician Eric Wahlforss, and the website was launched in October 2008. It was originally intended to allow musicians to collaborate by facilitating the sharing and discussion of recordings, but later transformed into a publishing tool for music distribution. According to Wired magazine, soon after its inception, SoundCloud began to challenge the dominance of Myspace as a platform for musicians to distribute their music. In April 2009, SoundCloud received €2.5 million Series A funding from Doughty Hanson Technology Ventures. In May 2010, SoundCloud announced it had one million users. In January 2011, it was reported that SoundCloud had raised US$10 million Series B funding from Union Square Ventures and Index Ventures. On 15 June 2011, SoundCloud reported five million registered users and investments from Ashton Kutcher and Guy Oseary's A-Grade Fund, and on 23 January 2012, it reported 10 million registered users. In May 2012, it was announced that SoundCloud had 15 million users, and site usage was increasing by 1.5 million users per month. A new APN was released in December 2012 which improved mobile device support and added features such as concurrent listening and site navigation, and the ability to create personal collections. The response from users was mixed, and many expressed dissatisfaction with the change. At this time, SoundCloud was reported to be "reaching 180 million people per month", with 10 hours of content being uploaded per minute. In March 2014, Twitter announced it would partner with SoundCloud in developing its first integrated music app. However, the project never moved forward because SoundCloud was unable to accommodate licensed music due to a lack of necessary arrangements with music labels. In July 2013, SoundCloud had 40 million registered users and new users were joining at a rate of 20 million per month. SoundCloud announced in January 2014 that it had commenced licensing negotiations with major music companies to address the matter of unauthorised, copyrighted material regularly appearing on the platform. The announcement followed a round of funding in which US$60 million was raised, resulting in a $700 million valuation. According to media sources, the negotiations were initiated in an attempt to avoid similar problems faced by Google, which had been forced to handle a large number of takedown notices on its YouTube video-sharing platform. In May 2015, it was reported that Twitter was considering the acquisition of SoundCloud for approximately US$2 billion. However, the prospect of acquisition was discounted by the media, with one report stating that "the numbers didn't add up", and Bobby Owsinski hypothesizing on the Forbes website in July that SoundCloud's ongoing inability to secure deals with the major music labels was the foremost culprit. On 28 September 2016, Spotify announced that it was in talks to buy SoundCloud, but on 8 December 2016, Spotify was reported to have abandoned its acquisition plans. In July 2017, SoundCloud announced that it would close its San Francisco and London offices and lay off 173 out of 420 employees in an effort to become profitable, with the remaining staff operating out of offices in Berlin and New York. In August 2017, SoundCloud announced that CEO Alex Ljung will step down from his role, with former Vimeo CEO Kerry Trainor replacing him. In August 2014, SoundCloud announced a new program known as "On SoundCloud", which would allow "premier" partners to monetize their content through pre-roll audio ads, channel sponsorships, mobile display ads, and native content. The company announced deals with a number of content partners (including Comedy Central and Funny or Die), independent labels, and YouTube multi-channel networks, and that it was in "active and ongoing, advanced discussion[s]" with major record labels. In December 2014, it was reported that SoundCloud could potentially raise approximately US$150 million in new financing, resulting in a valuation surpassing one billion dollars. The major label issue became prominent again when the new financing information was released, as the lack of monetization was presented as an issue—SoundCloud had managed to sign an agreement with Warner Music Group as part of the new premier program that allows both Warner Music, which also has a minor stake in the company, and its publishing division to collect royalties for songs they have chosen to monetize on the site; meanwhile, the other labels remained skeptical of the company's business model. By December 2014, SoundCloud had shared ad revenue with about 60 other Premier Partners. Concerns over the amount of revenue from the program led Sony Music Entertainment to pull its content from the service entirely in May 2015. In June 2015, SoundCloud announced that it had reached a deal with the Merlin Network, a group representing 20,000 independent record labels, to monetize their content through the premier partner program. In February 2017, SoundCloud launched a mid-range subscription tier named SoundCloud Go, that allows users to remove ads and listen offline for $5 per month. The original version, which was renamed SoundCloud Go+, allows access to over 150 million songs, offline playback, no ads, no previews, and premium music tracks for $10 per month. SoundCloud's key features include the ability to access uploaded files via unique URLs, thus allowing sound files to be embedded in Twitter and Facebook posts (note: as of 12 August 2015[update], mobile devices require a SoundCloud app to play a track within Facebook, an issue confirmed by SoundCloud in November 2016). A file may be embedded by clicking a share button corresponding to the target site (e.g., Twitter). This contrasts with MySpace, which does not have reshare buttons. Registered users can listen to unlimited audio and may upload up to 180 minutes of audio to their profile at no cost. Users are allowed to create playlists (previously known as "sets"), and to "Like" (specific tracks, which will then be saved to the user's "Like" page), "Repost", "Share", to "Follow" another user, and to make complimentary downloads of their audio available. SoundCloud's API allows programs to upload music and sound files, or download files if the uploader has gave permission to do so. This API has been integrated into several applications, including DAW software such as GarageBand, Logic Pro, and Studio One. SoundCloud supports AIFF, WAV, FLAC, ALAC, OGG, MP2, MP3, AAC, AMR, and WMA files. It then transcodes them to MP3 at 128 kbit/s and Opus at 64 kbit/s for streaming purposes. Soundcloud supports Creative Commons licenses. On 29 March 2016, SoundCloud unveiled SoundCloud Go, a subscription-based music streaming service; the service provides an ad-free experience, offline playback, and integrates licensed music from major labels into the existing, user-uploaded content of the service. Co-founder Eric Wahlforss stated that this aspect would help to differentiate SoundCloud Go from other music streaming services such as Spotify and Apple Music, as it technically provides a larger total library of songs than competing services, with a higher degree of diversity in its content. The Verge found that, excluding existing content uploaded by users, the service's initial library of songs is smaller than those of its closest competitors. The service was initially priced at US$10 per-month. On 28 February 2017, SoundCloud renamed its main Go plan SoundCloud Go+, and added a secondary tier titled SoundCloud Go at a US$5 price point, which does not include the licensed music library, but still offers ad-free and offline playback. SoundCloud offers two mobile apps; the main SoundCloud app is oriented towards streaming, with music discovery, playlist, and sharing features. In November 2015, a separate app known as SoundCloud Pulse was released for Android and iOS; it is primarily oriented towards content creators, allowing users to upload and manage their uploads, reply to comments, and view statistics. Pulse's features were previously located within the main app; senior marketing manager Brendan Codey explained that the shift to separate apps was meant to allow SoundCloud to improve its user experience for content consumers, without having to worry about how these changes affect features oriented towards creators. By the end of 2016, SoundCloud Pulse had over 100 million downloads. On 1 April 2017, Chromecast support was added to the main SoundCloud iOS app. SoundCloud has repeatedly attempted at creating desktop client equivalent to their mobile applications to compete with services like Spotify, which maintain and develop their own client. Although there are many community third-party desktop applications such as SoundCleod and SoundNode, SoundCloud has never actually created a desktop application equivalent to their mobile applications. On 6 January 2011, SoundCloud released "SoundCloud Desktop app for Mac" to the App Store for Macintosh, which introduced the playlist feature to SoundCloud. However was limited to tracks that have allowed third-party application playback, even though the application was a first-party release, leaving many frustrated. The application was later discontinued due to the lack of resources maintaining their new desktop application, the mobile applications, and the web browser at the same time. On 2 May 2017, SoundCloud released an application for Xbox One, set as the basis for the beta desktop version to be released later that month. It was released only missing a few features compared to the desktop beta, mainly 'shuffle', the ability to cast a song from an external device, and the ability to go forward or backward in a playlist without using Cortana. All of which were fixed in a patch, released later on. On 30 May 2017, SoundCloud released "SoundCloud for Windows (Beta)" to the Windows 10 Microsoft Store (digital). It was released missing many core features that were in SoundCloud's mobile apps such as 'repeat', and basic animations. It also was missing many features from its previous "SoundCloud Desktop app for Mac" version, such as application specific volume control, and the ability to upload and manage tracks from the client. However the application included voice control via Microsoft's Cortana, and unlike its previous desktop application, it supported all tracks regardless of their 3rd-party application playback ability. The app (as of current) has not been updated or changed from its initial release, leading many to believe that similar to the previous application SoundCloud is struggling to manage the desktop application in conjunction with their mobile and web versions. As SoundCloud evolved and expanded beyond its initial user base, consisting primarily of grassroots musicians, many users complained that it had sacrificed its usefulness to independent artists in an attempt to appeal to the masses, perhaps in preparation for public sale. Such criticism particularly followed the launching of a revamped website in 2013 which, according to former CEO Alexander Ljung, was implemented for the purpose of increasing SoundCloud usage. On 3 July 2014, TorrentFreak reported that SoundCloud offered unlimited removal powers to certain copyright holders, allowing those copyright holders to unilaterally remove paid subscribers' content without recourse. In April 2015, SoundCloud announced a new partnership with Zefr, a content tracking company that works with YouTube to help identify songs on the platform and facilitate either takedowns or ads being run against it. Zefr states it will "better understand the sharing of content on the platform." Some users are worried it could mean a stricter copyright enforcement and more ads. In July 2016, SoundCloud notified registered users via email that it would be "phasing out" groups because they "were not a strong driver to help users share their new tracks to the most users effectively". 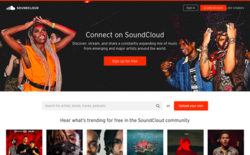 This announcement was met with alarm and concerned responses from numerous artists, who deemed the change unacceptable because it would eliminate their only effective means of sharing music on SoundCloud. SoundCloud has a continuous play feature on non-mobile platforms which relates to the listener's stream and likes. Unlike YouTube's autoplay feature which is on by default but can be turned off, users cannot turn off the continuous play feature on SoundCloud. SoundCloud has also been criticized for changes in service. The new update of the website and application made the feed and interface more difficult to use for some users. Also, the anti-piracy algorithm — which was put into place to combat the staggering number of illegal music downloads — has often been criticized for taking down music that was not illegally submitted or downloaded. Also, Universal Music Group has the right to take down any files on SoundCloud. Uploads can be taken down directly by Universal Music Group outside of SoundCloud's anti-piracy policy. Other than uploads, Universal Music Group has the ability to take down accounts, both premium and free. Customers of the company have claimed this to be "bogus," arguing that the right to manage and delete accounts should be reserved to SoundCloud itself, not to an outside company. The government of Turkey blocked access to the SoundCloud website on 24 January 2014. A user named "haramzadeler" ("bastards" in Turkish) uploaded a total of seven secretly recorded phone calls that reveal private conversations between the Former Turkish Prime Minister Now President of Turkey, Recep Tayyip Erdoğan, and others, including: Erdoğan Bayraktar, local politicians, some businessmen, and the prime minister's daughter, Sümeyye Erdoğan [tr], and son, Bilal Erdoğan. Linked to the 2013 corruption scandal in Turkey, some conversations on the recordings revealed illegal activity and possible bribery—mainly about the building permit for villas located on protected cultural heritage sites in Urla, İzmir. The opposition party Cumhuriyet Halk Partisi submitted a parliamentary question to TBMM (the Grand National Assembly of Turkey) concerning the issue, which asked why SoundCloud services were banned without any proper cause or reason. ^ "Soundcloud.com Traffic, Demographics and Competitors - Alexa". www.alexa.com. Retrieved 24 August 2018. ^ Jenna Wortham, SoundCloud, an Audio-Sharing Site, Hits 5 Million Users. New York Times, June 15, 2011. ^ a b c d e Eliot Van Buskirk (6 July 2009). "SoundCloud Threatens MySpace as Music Destination for Twitter Era". Wired. ^ a b c Mike Butcher (18 May 2010). "Now a million on SoundCloud – This startup is scaling globally". TechCrunch. ^ David Noël (23 January 2012). "SoundCloud Hits Ten Million Users". SoundCloud. ^ a b Drew Olanoff (9 May 2012). "SoundCloud announces "Next" version of its site, hits 15M users". The Next Web. The Next Web, Inc. Retrieved 11 December 2014. ^ Robin Wauters (10 December 2012). "SoundCloud user accuses SoundCloud of "doing a Zuckerberg" – on SoundCloud". The Next Web. The Next Web, Inc. Retrieved 11 December 2014. ^ Martin Bryant (4 December 2012). "With 10 hours of audio uploaded every minute, SoundCloud rolls its new site design out to all users". The Next Web. The Next Web, Inc. Retrieved 11 December 2014. ^ Peter Kafka (13 March 2013). "Twitter's Music App Will Let You Watch, Too, With Help From Vevo". All Things D. Dow Jones & Company Inc. Retrieved 11 December 2014. ^ a b Peter Kafka (24 January 2014). "SoundCloud Has a New Pile of Cash, and Wants to Cut Deals With Big Music". ReCode. Revere Digital LLC. Retrieved 11 December 2014. ^ Jefferson Graham (17 July 2013). "Who's listening to SoundCloud? 200 million". USA Today. ^ Ellis Hamburger (24 January 2014). "SoundCloud pursuing its first licensing deals with record labels". The Verge. Vox Media, Inc. Retrieved 11 December 2014. ^ Tom Pakinkis (28 March 2014). "SoundCloud holding licensing talks with labels - report". Music Week. Retrieved 31 March 2014. ^ Bobby Owsinski (24 July 2014). "Major Labels Buying Into Soundcloud Sets It Up For Acquisition". Forbes. Forbes, LLC. Retrieved 11 December 2014. ^ Nathan Ingraham (20 May 2014). "Twitter's plans to purchase SoundCloud have evaporated, claims report". The Verge. Vox Media. Retrieved 11 December 2014. ^ McIntyre, Hugh (28 September 2016). "Is Spotify Buying SoundCloud?". Forbes. Retrieved 9 October 2016. ^ Russell, Jon (8 December 2016). "Spotify has backed out of talks to acquire SoundCloud". TechCrunch. Retrieved 9 December 2016. ^ "SoundCloud Cuts 40% of Staff in Push for Profitability". Bloomberg.com. 6 July 2017. Retrieved 10 July 2017. ^ "SoundCloud » A note from Alex Ljung". blog.soundcloud.com. ^ Constine, Josh. "SoundCloud sinks as leaks say layoffs buy little time". Techcrunch. Retrieved 21 September 2017. ^ "SoundCloud saved by emergency funding as CEO steps aside". ^ "SoundCloud Debuts Monetization Play With 'On SoundCloud', Announces $100 Million In Funding". Billboard. Retrieved 29 March 2016. ^ a b Jill Krasny (9 December 2014). "SoundCloud May Soon Join the Billion-Dollar Startup Club". Inc. Monsueto Ventures. Retrieved 11 December 2014. ^ "Sony pulls music from SoundCloud over money dispute". The Verge. Retrieved 29 March 2016. ^ "Soundcloud Signs Indie Labels As It Preps Subscription Service". Variety. Retrieved 29 March 2016. ^ "Soundcloud strikes licensing deal with Universal Music Group". The Verge. Retrieved 29 March 2016. ^ Sarah Perez, TechCrunch. “SoundCloud confirms its deal with Sony Music, paving the way for its subscription service's launch.” 18 March 2016. 18 March 2016. ^ "Sony Has Officially Signed On To SoundCloud". Forbes. Retrieved 21 March 2016. ^ Digital Trends (28 February 2017). "SoundCloud debuts middle-tier streaming service, its cheapest ad-free option ever". Parker Hall. Retrieved 1 March 2017. ^ Parker Hall (28 February 2017). "SoundCloud debuts middle-tier streaming service, its cheapest ad-free option ever". Digital Trends. Retrieved 1 March 2017. ^ Max Buondonno (28 February 2017). "SoundCloud Introduces $5/Month Go Plan, Renames $10/Month Plan 'Go+'". MBEDDED. Retrieved 1 March 2017. ^ "SoundCloud Help Community". Archived from the original on 9 January 2017. ^ Woods, Ben (4 January 2014). "15 of the best music streaming platforms online today. Which one is best for you?". TheNextWeb.com. ^ "Introducing On SoundCloud, our new creator partner program". SoundCloud Blog. Retrieved 27 September 2014. ^ "On SoundCloud". Retrieved 27 September 2014. ^ "SoundCloud Music & Audio". Soundcloud HQ. Retrieved 18 February 2017. ^ "Musikmesse 2010: PreSonus launches major enhancements to Studio One". MusicRadar.com. 22 March 2010. Retrieved 27 April 2010. ^ "Uploading requirements". SoundCloud. SoundCloud. Retrieved 21 March 2016. ^ "SoundCloud changed its audio format and users are not happy about it". Fact Magazine. Fact Magazine. Retrieved 25 September 2018. ^ "SoundCloud launches simplified, cheaper Pro plans and embraces brands with Pro Partner accounts". The Next Web. Retrieved 29 March 2016. ^ a b "SoundCloud Adds $5 Monthly Plan". PC Magazine. Retrieved 28 February 2017. ^ "SoundCloud offers a subscription service in a late play for mainstream music fans". Los Angeles Times. Retrieved 29 March 2016. ^ Kastrenakes, Jacob (29 March 2016). "SoundCloud's subscription streaming service is here (and it needs work)". The Verge. Retrieved 16 July 2016. ^ "No One Wants to Pay $9.99 for Your Remixes". Bloomberg.com. 4 January 2017. Retrieved 28 February 2017. ^ "In Wake Of Apple Music, SoundCloud Update Focuses On Music Discovery, Better User Experience". TechCrunch. AOL. Retrieved 29 March 2016. ^ "SoundCloud Rolls Out A Dedicated App For Creators". TechCrunch. AOL. Retrieved 29 March 2016. ^ "SoundCloud - Music & Audio - Android Apps on Google Play". play.google.com. Retrieved 25 August 2016. ^ Welch, Chris (1 April 2017). "SoundCloud adds Chromecast support on iOS". The Verge. Retrieved 1 April 2017. ^ "SoundCleod - SoundCloud for macOS and Windows". soundcleod.com. ^ Lancaster, Michael. "Soundnode". www.soundnodeapp.com. ^ "SoundCloud » The SoundCloud Desktop App". blog.soundcloud.com. Retrieved 21 June 2018. ^ "Get SoundCloud for Windows (Beta) - Microsoft Store". Microsoft Store. Retrieved 21 June 2018. ^ "SoundCloud for Windows [beta]". SoundCloud Help Center. Retrieved 21 June 2018. ^ Rooney, Ben (3 November 2011). "Soundcloud, Wonga Win Tech Tour Awards". The Wall Street Journal. ^ "Tech Tour". Archived from the original on 30 January 2012. ^ Mac, Ryan (26 April 2013). "SoundCloud Manages Criticism as it Moves to Become the YouTube of Audio". Forbes. ^ "Universal Music Can Delete Any SoundCloud Track Without Oversight". TorrentFreak. 3 July 2014. ^ "Soundcloud Boldly Releases New App, Allows Universal to Flag Your Account, and Quietly Announces Data Mining, All in One Month". Complex Media. 3 July 2014. Archived from the original on 20 October 2017. ^ "SoundCloud Partnering With Zefr, YouTube's Copyright Enforcement Manager". Music Times. Retrieved 22 January 2017. ^ "I'm a moderator. How can delete tracks in group in new design of site?". Retrieved 21 December 2016. ^ "SoundCloud is phasing out groups, one of the few remaining ways to actually share my music to new listeners". Retrieved 21 December 2016. ^ "How do I disable that #$%#$% Autoplay". SoundCloud Community. ^ "SoundCloud More Affordable for Creators, As Service Attempts Balancing Acts [Analysis] - CDM Create Digital Music". 25 March 2013. ^ "SoundCloud Has Given Universal Music Group The Ability To Directly Remove Content - Techdirt". Retrieved 1 July 2016. ^ Marc Hogan. "Has Turkey Banned SoundCloud?". Spin. Retrieved 4 February 2015. According to a report from New York-based online news startup Vocativ, earlier on January 27 a Twitter user posted links to SoundCloud audio of phone conversations by Turkish Prime Minister Recep Tayyip Erdogan, whose government has been cracking down after allegations of widespread graft. ^ Oray Egin. "Loose Lips Threaten Turkey's Powerful". Vocativ. Archived from the original on 29 January 2014. Retrieved 30 January 2014. ^ "Erdoğan Sacks Izmir Gov'nor for Shady Villa Deal". Aydınlık. Archived from the original on 22 December 2014. Retrieved 30 January 2014. ^ "Soundcloud.com'u Erdoğan mı kapattı?". Sözcü Newspaper (in Turkish). Sözcü. Retrieved 25 January 2014. ^ "Turkish main opposition questions Erdoğan about Urla villas". Today's Zaman. Archived from the original on 28 January 2014. Retrieved 30 January 2014. Caramanica, Jon (June 22, 2017). "The Rowdy World of Rap's New Underground". The New York Times. ISSN 0362-4331. Deahl, Dani (21 July 2017). "How SoundCloud's broken business model drove artists away". The Verge. Retrieved 21 July 2017.